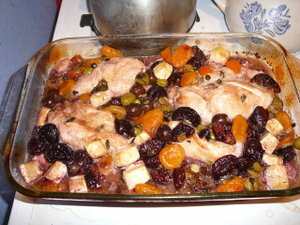 Mix together the vinegar, garlic, oregano, seasoning, oil; prunes, apricots olives, capers and bay leaves in a large bowl. Place the chicken in the marinade, cover, refrigerate and leave to marinate for 4 hours or overnight if possible. Preheat the oven to 325 F (180 C, Gas Mark 4). Arrange the chicken in a shallow baking dish in a single layer and pour over the marinade. Sprinkle the chicken with brown sugar and pour the wine around. Bake for 30 - 40 minutes until the chicken is well browned. Serve over rice or cous cous. awww billy your not sposed to starve yourself rofl...I thought you were looking a bit thinner of late hehe..I better restrict your rum rations from now on rofl. How about you post some low fat recipes on your site? I sure could do with some. I wouldn't be able to eat this chicken one because of all the fruit that is in it would play up with me making me visit the loo prolly all day long. It looks nice tho. Sounds yummy meg, I'm definitely going to give it a try, only I'll probably triple the portions, how's about coming up with some good italian recipes eh? i'm counting on you for the italian recipes, silly! i've changed the pic to one that's of *cooked* food. the uncooked was pretty, but the new one is pretty decent as well. vanessa's version of this was a bit tastier. i think she had better (and more) olives. i added tofu for me. it came out ok. i think i should have marinated it longer, though. This is the most gorgeous meal, taken from Gourmet Traveller years ago. The pics don't do it justice, very ugly. @ Feta Cheese? Lol Americans, how to wreck food. yeah, i can't imagine feta in this. but in the couscous salad i've been making lately, it's delicious!